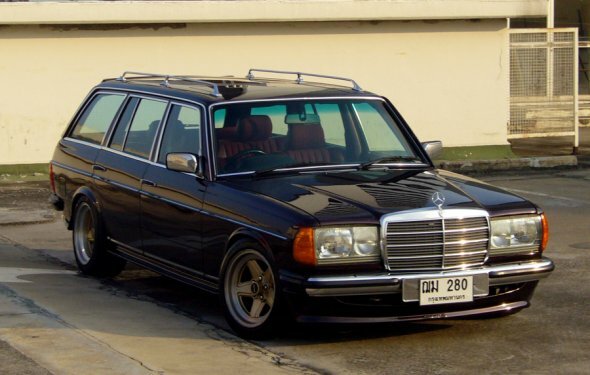 A lovely example of Mercedes most reliable car the 300 Turbo Diesel Wagon. The car was recently purchased from the estate of the owner who sadly passed away. One Southern Californian owner since new, with extensive documentation, original bill of sale, all service books, owners manuals, data card, detailed service records since day one. I even have the cleaning cassette tape, and the unopened antenna cleaning cloth! The original California blue and yellow plates are still on her, the paint is beautiful, interior is immaculate. The best colour combination of silver with black interior, amazing condition with only 77, 800 documented miles. No smog required she is a turbo diesel. I have just spent $1, 000 on a new air conditioning compressor, drier, and vacuum modulators. Also just fresh oil change, valve cover gasket and 2 new front tires. Most of these old Benzes are 200, 000 or 300, 000 mile beaters, but this a real rare gem in this condition, documentation, and this mileage, she is worthy of being in a museum. Paint is excellent, interior is perfect, dash pad has no cracks, wood is excellent no cracks. Cold air conditioning, power windows, power locks, manual sunroof. No rust anywhere this is a So Cal car always garaged since new. All lights, wipers, cruise control are operational. Needs nothing but a driver, i just took her on a 200 mile drive and she performed flawlessly. Probably the best W123 wagon out there. Inspections are welcome and encouraged. 310 739 7180 offered for sale locally and i reserve the right to end the auction. If you want to buy it now call me on 310 seven 39 seven 180 ask for neil and lets make an offer and lets make a deal. Only bid if you are able to pay for the car, and you have your funds available to complete the sale. If you have to ask your wife, mother, bank manager, cat or dog! then please do not bid. I encourage inspections but before you bid, i will happily take the car to any mercedes mechanic at your cost in the west los angeles area. If you have negative feedback or no feedback ask me before you bid.